With guidance from the Natural Resources Conservation Service (an agency of the Department of Agriculture charged with helping farmers and ranchers to optimize pasture health, among other missions), I’m building a dry lot. A dry lot is a space in which horses can move freely, eat hay, drink water, and lick salt while staying off pasture. Construction of the dry lot will help the larger pasture recover from several seasons of overgrazing. Check out our DIY Index for more projects. 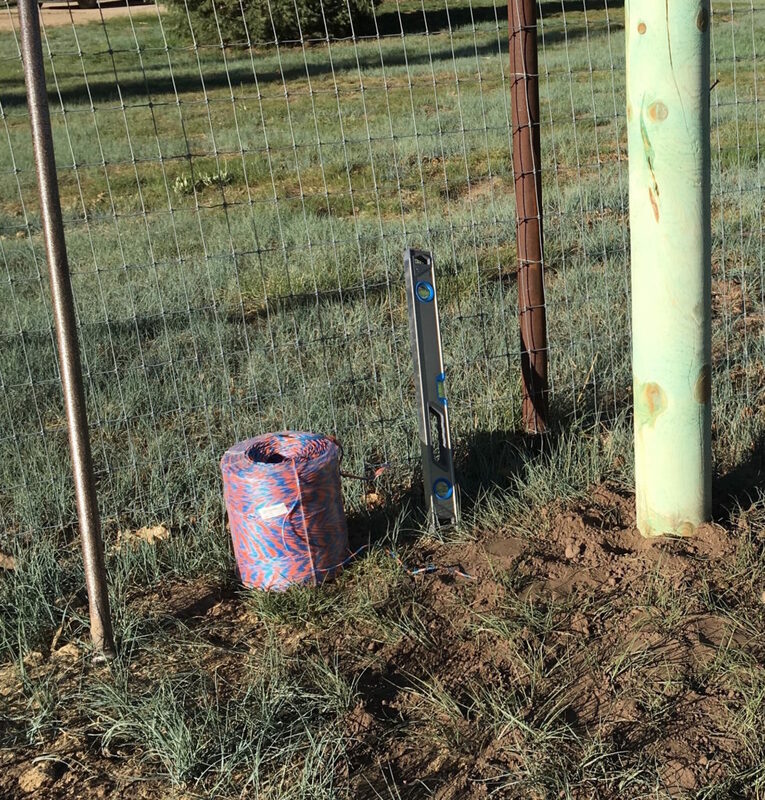 Implements for straightness: baling twine, level, and heavy steel pipe for tamping down dirt around posts. First, I picked an area that would allow for several horses to move freely while being away from my well (to avoid contamination from this concentrated area of pooping) and situated for easy viewing from the house. It is an irregular rectangle measuring about 100 x 145 x 150 x 160 feet. 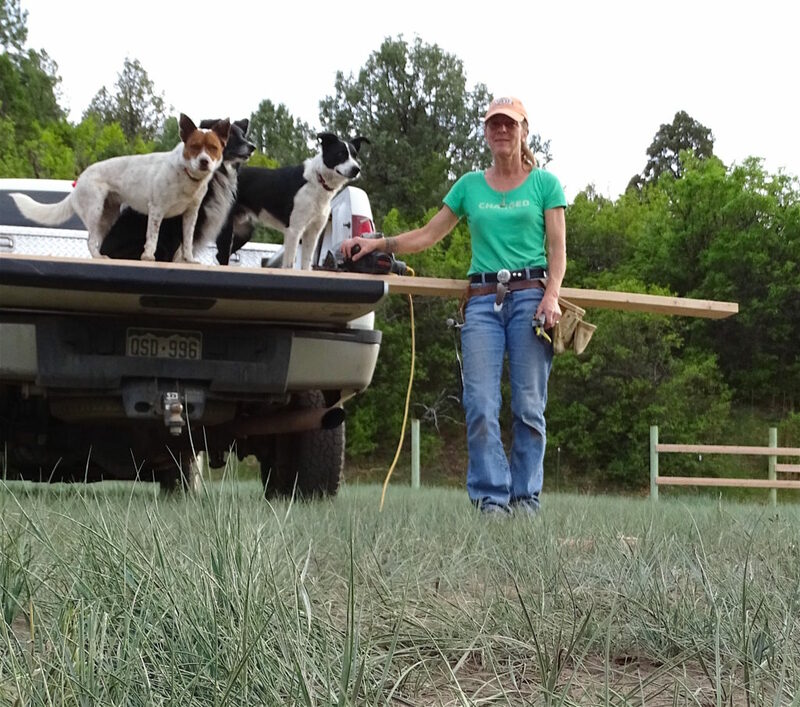 As with the DIY Round Pen project, it all started with a big pile of wood. 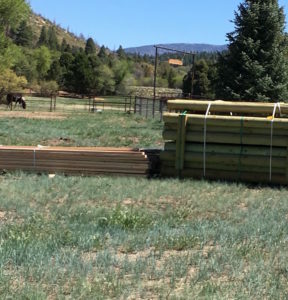 Specifically, I purchased about 50 posts (eight feet long, six inches in diameter) and 70 lengths of two-by-six lumber (16 feet in length). Post setting: each 8-foot, 6 inch diameter, pressure-treated post was set, dirt tamped down, and leveled. Rail measurements and setting: I strung another line and set screws on which to place the 2 x 6 rails. The screws – nails would have worked, too – serve as mini-ledges so that you don’t need a helper. (Yes, with exception of the posthole digging, this dry lot was constructed with no assistance.). Rails cut and screwed to posts. 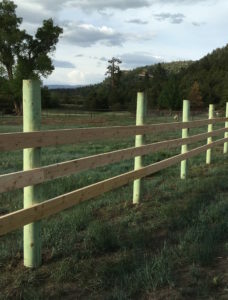 Even when posts are set accurately, the eight-foot spans between them end up varying by an inch or three. I ran a cord for the skilsaw and used my truck as a sawhorse. I measured, marked with speed square, and cut each length appropriately. 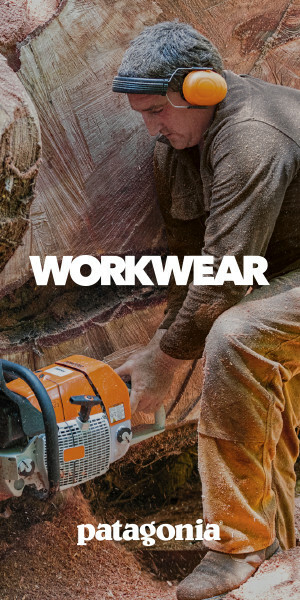 Measure and cut the posts with a chain saw (image at right is before cutting). All told, the project cost about $2,400 and took about a week of steady work. Footnote: I worked for a carpenter for several years and picked up essential skills that help me in property maintenance and improvement.